Need a Call Center for Your Law Firm? Learn everything you need to know to choose the right call center service provider. Is your firm's call volume out of control? Do you struggle to guarantee a live response to new cases after-hours? Are you worried that you are losing cases to competitors with better response times? Our free e-Book, "Don't Settle for the Wrong Legal Intake Provider," provides the information you need to know before hiring an legal intake service for your firm. Most importantly, you'll find the 3 steps you should follow to choose a provider that is right for you. We've even included questions to ask and criteria to require. 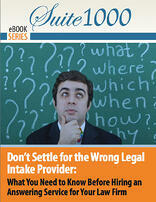 Complete the form to download your free copy of "Don't Settle for the Wrong Legal Intake Provider."